Jupiter, FL – April 3, 2019 – Question: what do you get when you combine a Hollywood veteran, a Florida-based funk / soul / ska temptress and two members of a SoCal ska / reggae / surf rock powerhouse? Answer: the Higher Vibez Tour! Peter Dante, Beebs from Beebs and Her Money Makers, and Hayden and Jacob from Tunnel Vision have aligned their creative talents to bring Jupiter music fans an acoustic experience filled with new looks at popular originals, classic sing-alongs, and a charisma that joyfully captivates an audience. Show takes place at Guanabanas Island Restaurant & Bar on Thursday, April 18, 2019, at 9 p.m., and is open to those 21 and over. “This show is a can’t miss / must-see affair,” says Talent Buyer Matt Cahur. “Join us for an evening of musical fun and high vibrations.” Cahur founded Roots Music, Inc. more than 20 years ago and now manages rock and reggae acts, and produces and promotes local and regional concerts. The venue’s lead sound engineer, he books all of the musical acts; he’s is also an accomplished songwriter and guitarist. Guanabanas, the award-winning and popular waterfront venue, is located at 960 N Hwy A1A, Jupiter, FL 33477. A West Hartford, CT native, Dante is a frequent collaborator with comedian and filmmaker Adam Sandler. He’s starred in pictures such as Waterboy (1998), Little Nicky (2000), Big Daddy (1999), 50 First Dates (2004), and Mr. Deeds (2002), and appeared on the Larry Sanders Show, The Jeff Foxworthy Show, Grandma’s Boy (2006), and Strange Wilderness (2008). His latest film is 2013’s Grown Ups 2. Dante is also a singer / songwriter. Based in Orlando, FL, Beebs has been recording and touring with her band The Money Makers since 2010. Since releasing a debut EP Welcome to Bartertown in 2011, they have crisscrossed the States in support of Reel Big Fish, Goldfinger, and Five Iron Frenzy, and played all 40 dates of the 2013 Vans Warped Tour. Her latest full-length release is a solo recording called Eye Shine (2016); last year she issued a single called “Life is Too Short”, which was remixed by the Sabotage Soundsystem. 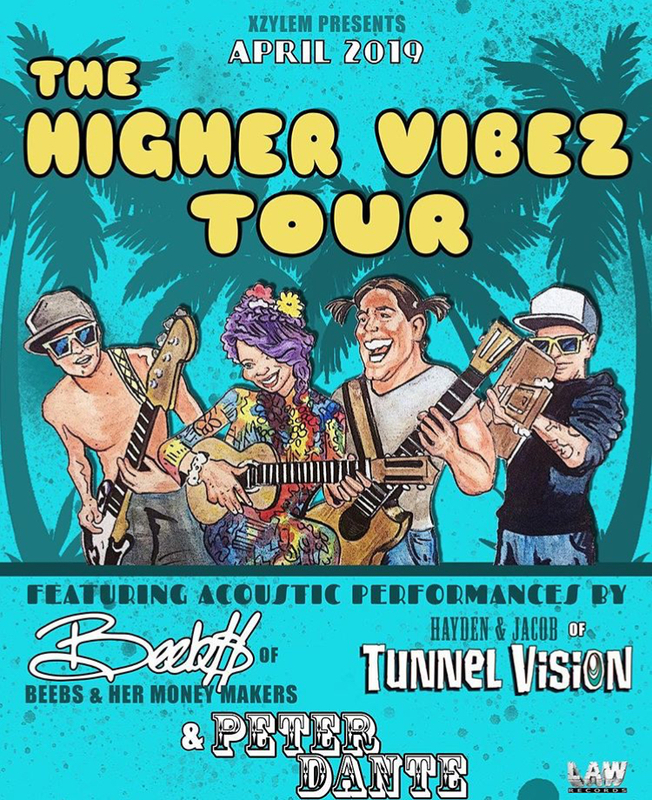 Hayden Hansen (guitar / vocals) and Jacob Hernandez (bass) make up two-fifths of the popular Orange County surf / reggae / ska band Tunnel Vision. The boys grew up with instruments in their hands and skateboards under their feet. Surf industry professionals, Hayden and Jacob have worked for Rip Curl and Lost Enterprises. They have released two full-lengths with Tunnel Vision to date, the latest being 2018’s Days Away.